Salman Khan made a surprise visit to Yash Raj Film Studios in Mumbai on 20 November, where he attended the first look launch of Shankar's 2.0. The Sultan actor admitted that he had dropped in uninvited in order to meet Rajinikanth. "I wasn't invited. I heard they were doing this and I decided to come to meet Rajini Garu," he said. 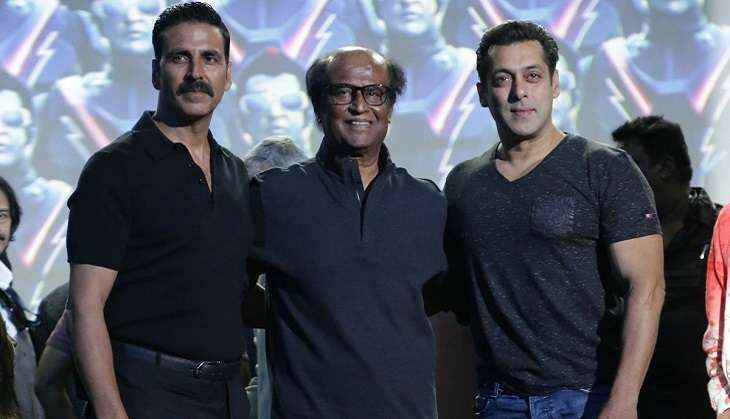 When Salman was invited on the stage to share a few words about the film and the star cast, he showered praise on Akshay Kumar, who plays the antagonist in Shankar's upcoming epic. "Akshay Kumar is one of the most talented actors that we have in our industry. I have worked with him a couple of times and he is phenomenal. I think that if there is anyone who has had growth in his acting career as a performer from our time, it is Akshay Kumar. He is one of those actors, who keeps on growing and growing and growing. He has one of the most hard-working and dedicated actors in our industry," said Salman. Akshay Kumar thanked Salman Khan for attending the event. "I would like to thank Salman Khan for coming all the way from Bandra (to Andheri) and for making this occasion special," he said. 2.0 is slated to hit the big screen in Diwali 2017.